On March 19, 1961, Pope John XXIII, gave, what was at the time, the longest papal document ever written on Saint Joseph. This apostolic epistle had as its primary purpose the naming of St. Joseph as Patron of the Second Vatican Council. After outlining at length the history of devotion to St. Joseph especially since Pius IX, and after proclaiming Joseph’s patronage over the Council, the Pope encourages prayer to him. Venerable brethren and beloved sons! Countless expressions of joy and expectation and of best wishes for the success of the Second Vatican Council have come to Us from every corner of the globe. They are stirring Us more and more to avail Ourselves of the good dispositions of all the many simple and sincere hearts whom We see so lovingly and generously devoting themselves to begging for God’s help, to growing in religious fervor, to achieving a clearer understanding of all that the celebration of the Council will require beforehand and will subsequently produce in the form of a development of the interior and exterior life of the Church, and of a spiritual revival throughout the whole world. And now, as a new spring breaks into view and we stand on the threshold of the Sacred Easter Liturgy, we find ourselves face to face with the kind and gentle St. Joseph, stately spouse of Mary, a figure so dear to the minds and hearts of those who are most responsive to the appeal of Christian asceticism and the forms of religious devotion that are quiet and unobtrusive, but all the sweeter and more pleasing for being so. But Joseph, except for some slight sprinkling of references to him here and there in the writings of the Fathers, for long centuries remained in the background that was so typical of him, like a kind of ornamental detail in the overall picture of the Saviour’s life. It took time for devotion to him to go beyond those passing glances and take root in the hearts of the faithful, and then surge forth in the form of special prayers and of a profound sense of trust and confidence. The fervent joy of pouring forth these deepest feelings of the heart in so many impressive ways has been saved for modern times; and it gives Us special pleasure to draw upon these treasures now for something quite pertinent and meaningful. The first two postulata that the Fathers of the First Vatican Council presented to Pius IX when they met in Rome (1869-1870) had to do with St. Joseph. Their first request was that devotion to him be accorded a higher place in the Sacred Liturgy; this document bore the signatures of 153 bishops. The other one, which had been signed by 43 superiors-general of religious orders, asked for the solemn proclamation of St. Joseph as Patron of the Universal Church. Pius IX greeted both requests with joy. At the very beginning of his pontificate [on September 10, 1847], he had set aside the third Sunday after Easter for the feast of the Patronage of St. Joseph. As early as 1854, in a devout and stirring talk, he had pointed to St. Joseph as the surest hope of the Church after the Blessed Virgin; and on December 8, 1870, when the Vatican Council had been suspended because of political events, he seized the occasion of the feast of the Immaculate Conception to issue a more solemn and official proclamation that St. Joseph was the Patron of the Universal Church and to elevate the feast of March 19th to the liturgical rank of double of the first class. The decree of December 8, 1870, issued Urbi et Orbi, was brief but beautiful and wonderful and really worthy of the Ad perpetuam memoriam, an it opened a vein of rich and precious inspirations for the successors of Pius IX. For the feast of the Assumption in 1889, the immortal Leo XIII issued the letter Quamquam pluries, the richest and fullest document that a pope ever issued in honor of the foster father of Jesus; it pointed up his characteristic role as the model for fathers of families and for workers. This was the origin of the beautiful prayer, “To thee, O Blessed Joseph,” that did so much to enrich the time of Our childhood. The Holy Pontiff Pius X added many new expressions of devotion and love for St. Joseph to those of Pope Leo, and he was more than happy to permit a work on this devotion to be dedicated to him. He also added to the treasure of indulgences attached to reciting the litanies that are so dear to Us and so comforting to say. At the outbreak of the first great European war, when the eyes of St. Pius X had closed on life here below, Divine Providence raised up Pope Benedict XV to move across the years from 1914 to 1918 like a kindly star bringing universal consolation. He too was quick to promote devotion to the Holy Patriarch. It is to him that we owe the introduction of two new prefaces into the Canon of the Mass; the preface of St. Joseph and the one for Masses for the Dead; he wisely linked them together by issuing the two decrees on the same day, April 9, 1919, as if to remind men of the way in which sorrows and consolations are mingled and shared in two families; the heavenly one of Nazareth that had St. Joseph for its legal head and the immense human family that had suffered universal grief because of the countless victims claimed by devastating war. What a sorrowing but at the same time consoling and fitting combination: St. Joseph on one side and St. Michael, the standard-bearer, on the other, each presenting the souls of the dead to the Lord into the holy light. The following year — on July 25, 1920 — Pope Benedict returned to the subject while preparations were being made for the fiftieth anniversary of Pius IX’s proclamation of St. Joseph as patron of the Universal Church, and he came back to it again from a theological point of view in the Motu proprio “Bonum sane,” that seemed to breathe an air of tenderness and unwavering trust. Oh! what a beautiful thing it was to throw new light on the meek and kindly figure of our saint and to have the Christian people call upon him, first of all to protect the Church militant at the very moment when they were beginning to rededicate their finest efforts to spiritual and material reconstruction in the wake of so many calamities; and second, to offer consolation to all the millions and millions of human victims, poised on the threshold of eternity, for whom Pope Benedict asked the bishops and the many pious societies throughout the world to offer up their prayers to St. Joseph, the patron of the dying. The last two pontiffs — Pius XI and Pius XII — of dear and venerated memory — showed a deep and edifying fidelity in following this same path of recommending fervent devotion to the Holy Patriarch in all of their appeals, their exhortations, and their inspiring words. At least four different times in solemn allocutions dealing with new saints, and very often at the annual celebrations of March 19th, for example in 1928, and again in 1935 and 1937, Pius XI took the opportunity to exalt the many glories that shone forth from the spiritual image of the Guardian of Jesus, the most chaste spouse of Mary, the pious and modest worker of Nazareth, and the patron of the universal Church, our powerful shield of defense against the efforts of world atheism, intent on wiping out Christian nations. Pius XII picked up this keynote from his predecessor and made it echo forth in the same tones, in so many allocutions that were always beautiful, vibrant, and timely. As on the 10th of April in 1940, when he invited newlyweds to place themselves under the gentle, protective mantle of the Spouse of Mary; and in 1945, when he called upon the members of Christian associations for workingmen to honor Joseph as their lofty model and the staunch guardian of their ranks; and ten years later, in 1955, when he announced that the annual feast of St. Joseph the Worker had been instituted. This recently established feast, celebrated on May 1st, takes the place of the one on Wednesday of the second week after Easter, while the traditional feast of March 19th will henceforth mark the solemn celebration of St. Joseph’s Patronage of the Universal Church. Venerable brethren and beloved sons! We felt that this particular March 19th would be a good time to recall these points of history and of religious devotion and offer them for devout consideration by you whose souls have been trained to a fine sense of how a Christian and Catholic should live and act and feel. We say this particular March 19th, because the feast of St. Joseph this year coincides with the beginning of passiontide and so helps prepare us to enjoy a deeper intimacy with the most profound and salutary mysteries of the sacred liturgy. The dispositions that lead us to cover the images of Jesus Crucified, of Mary, and of the saints with a veil for the two weeks that come before Easter also invite us to holy inner recollection and to communicating with the Lord through a prayer that ought to involve both meditation and frequent, lively supplication. Our Lord, the Blessed Virgin, and the saints are waiting for us to express our trusting, heartfelt prayers; and it is only natural for these prayers to center on the things that most closely correspond to the needs of the Catholic Church universal. There can be no doubt that the Ecumenical Council of the Vatican stands at the center and in first place among these needs and cares; it is now eagerly awaited by all those who believe in Jesus, the Redeemer, and belong to our Mother the Catholic Church, or to one of the various groups that are separated from it and yet still anxious — at least as far as many are concerned — for a return to peace and unity that will be in full accord with Christ’s teaching and His prayer to His Heavenly Father. It is only natural for Us to have as Our aim, in thus recalling the words of the popes of the last century, to stir up the Catholic world to work for the success of this great plan for order, for spiritual improvement, and for peace, which constitute the purpose and goal of an Ecumenical Council. Everything about the Church as Jesus established it is great and worthy of attention. The celebration of a Council gathers the most distinguished persons of the ecclesiastical world together around the Fathers — those who are most richly endowed with the gifts of theological and juridical learning, of organizing ability, of apostolic zeal and fervor. This is what a Council is: the Pope at the summit and around him and with him the cardinals, bishops from every rite and every country, the best-qualified scholars and teachers from various levels and from various fields, in which they specialize. But the Council is meant for the whole Christian people; they have an interest in it, for they will share in the more perfect communication of grace and of Christian vitality that will make it easier for them to acquire more quickly the truly precious goods of the present life and thus assure themselves of the riches of the eternal ages. And so everyone has an interest in the Council, clerics and laymen, the great and the small from every part of the world, every social class, every race, every color; and since we need a heavenly protector on high during this period of preparation and of development to ask for that divine power that will enable it to live up to its promise and be an epoch-making event in the history of the Church in our times, there is no saint in heaven who can better be trusted with the task than St. Joseph, the stately head of the Family of Nazareth and protector of the Holy Church. Whenever We listen to the echoes of the voices of the popes of this last century of our history, as We have just done, Our heart is particularly moved by the words of Pius XI, which were so typical of him on their calm and carefully thought out way of expressing things. They come down to us from a talk he gave on March 19, 1928 — a few words in honor of St. Joseph, or as he liked to call him, dear and blessed St. Joseph — that he just could not and would not hold back. Oh! the invocation of St. Joseph, the devotion to St. Joseph to bring his protection down on the Second Ecumenical Council of the Vatican. Venerable brethren and children of Rome, beloved children of the whole world! This is what we wanted to lead up to and this is why we are sending this apostolic letter on the 19th of March; We wanted the celebration of the feast of St. Joseph, the Patron of the Universal Church, to bring your souls the inspiration for an extraordinary renewal of fervor, that will come from a more lively, more ardent, and more constant prayerful participation in the cares of the Holy Church, your teacher and mother, your instructor and guide for this extraordinary event — the Twenty-first Ecumenical Council and the Second of the Vatican — to which the public press of the whole world has been devoting lively interest and respectful attention. You know very well that the first phase of organizing the Council is moving along calmly, effectively and in encouraging fashion. Distinguished prelates and clergymen by the hundreds have come from every part of the world and are now meeting here in the City; they have been divided up into various well-organized sections, each with responsibility for some important work all its own; they are following the lines laid down by the priceless contents of a series of imposing volumes that have gathered together the thoughts and experience and suggestions that are the fruit of wisdom, intelligence and apostolic zeal that constitutes the real wealth and treasure of the Catholic Church of the past, present, and the future. All the Ecumenical Council needs in order to reach a successful conclusion is the light of truth and of grace, the discipline of study and of silence, and a serene peace and trust in minds and hearts. This is on the human side. On the other hand, the Christian people must call down God’s aid from on high through their prayers and through their efforts to lead model lives that will be a forestate and a first evidence of the firm determination that each one of the faithful must make to apply and put into practice the teaching and directives that will be proclaimed at the end of the eagerly-awaited event — which is now well on its way to what promises to be a successful conclusion. Venerable brethren and beloved children! That brilliant thought of Pope Pius XI on March 19, 1928 is still pursuing us. Here in Rome, the sacrosanct Basilica of the Lateran always reflects the glory of the Baptist. But the massive temple of St. Peter, where relics and reminders that are precious to all Christendom are venerated, also has an altar to St. Joseph; and today, March 19, 1961, We wish to express Our intention of seeing that altar of St. Joseph take on a new and fuller and more solemn splendor, and of having it become a point of attraction and of religious devotion for individual souls and for countless crowds. For beneath these heavenly vaults of the Vatican temple, the ranks of those who make up the Apostolic College, drawn from every corner of the globe — even the most distant ones — will assemble around the Head of the Church for the Ecumenical Council. O St. Joseph! Here, here is where you belong as Protector Universalis Ecclesiae! Our intention was to use the words and the documents of Our immediate predecessors over the last century — from Pius IX to Pius XII — to offer you a garland of honor, which would crystallize the expressions of affection and veneration that are now rising everywhere — from Catholic nations and in mission regions. Always be our protector. May thy inner spirit of peace, of silence, of good work, and of prayer for the cause of Holy Church always be an inspiration to us and bring us joy in union with thy blessed spouse, our most sweet and gentle and Immaculate Mother, and in the strong yet tender love of Jesus, the glorious and immortal King of all ages and peoples. Amen. Given at Rome, at St. Peter’s, March 19, 1961, the third year of Our Pontificate. The mosaic, over nine feet high and made of individual tiles all less then half an inch square, reproduces a painting of the Milanese artist, Achille Funi (born c. 1892). 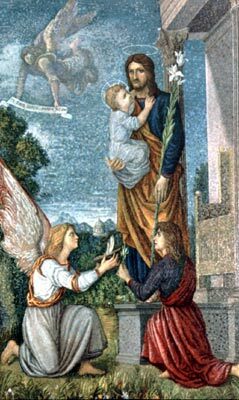 St. Joseph stands on a classical marble pedestal, with Jesus in arm and flowering staff in his left hand. The Child affectionately holds and looks toward his earthly father. At St. Joseph’s feet an angel kneels offering him St. Peter’s boat with supplicant expression. A human person also kneels offering him an olive branch with a plea for true peace. Another angel flies down from heaven with a banner that reads Tu eris super domum meam, “You shall be over my house.” In a word, St. Joseph’s image in the mother church of all Christendom recalls his role as protector of the entire Church. St. Joseph hears the prayers of all who invoke him, whether in the humblest little chapel or the world’s greatest basilica.